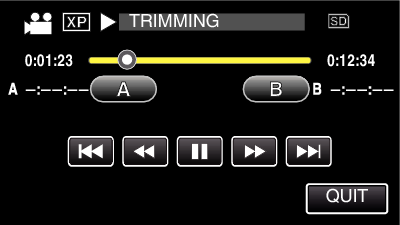 If the mode is still image, tap on the recording screen to display the mode switching screen. Tap the video to edit. Tap to pause playback at the desired start point, then tap “A”. When “A” is tapped, the start point is set. After setting the start point, tap to continue playback. Tap to pause playback at the desired end point, then tap “B”. When “B” is tapped, the end point is set. 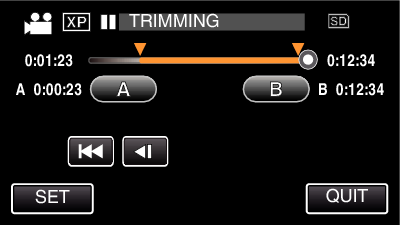 To reset the start or end point, tap “A” or “B” at the desired scene (position). 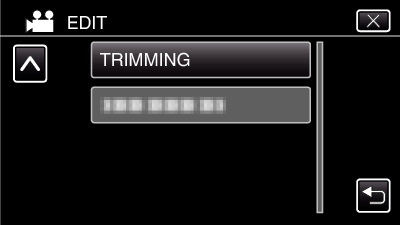 When “SET” is tapped, the trimming area is confirmed. When copying finishes, the copied file is added to the index screen. The division point may deviate slightly from the selected scene.